To be or not to be? That is really not a question. The question is how to transform 12 awesome days into just two pages. Well I will try. I know. I am probably not the only one who thinks this, but I really believe that we have experienced something special in Alicante this summer. Do you want to know why? Then you should continue with reading! For me it was the first time I have ever been to Spain, so I was very excited about the whole trip. Last year I was organizing SU in Prague so I I knew that I would have a great time. And it was also the last summer as a student for me, so I was ready to make the most of it. However the two weeks in Alicante totally exceeded my expectations. And not only mine. I am pretty sure that our SU is going to attack the front ranking positions because our organizers did a really great job! And you should also know that I was writing a “SU diary” every day. That’s basically the reason why it was natural for me to sign up for writing this article. I recommend it to everyone. I still have smile on my face as I was reading those pages. Unfortunately this article is not long enough to tell you about all the experiences and crazy nights we had. So I am going to focus on a few things which were special to me. I have to admit that I really hate getting up early in the morning – who does not? However I loved to wake up in Alicante. Even though my average sleep time was around 4 hours per night, I must appreciate Melissa as the best morning DJ ever. Her songs always brought a smile one my face no matter how bad my hangover was. We were all sleeping in the local high school gym together which was another thing I liked a lot. There were only us in the whole school area so we could party/chill/do whatever we wanted and nobody was bothering us. That was really great. Another thing I really appreciated was that even though it was not a traveling SU we were traveling a lot. Although it was probably not easy, organizers ensured enough cars so we were able to visit many beautiful places around Alicante. When I was told that we traveled more than 1200 km in 12 days I was not surprised at all. It is impossible to tell you about all those places but believe me – it was totally worthy. My favourite ones were probably Penon de Ifach ( a mountain on the sea shore where we climbed up to the top of) and Tabarca island. Why? Just google it. And visit those places if you will ever be on Costa Blanca. You will not regret it. However all those places we visited were not the reason why our SU was so special. The special ones were the people and the atmosphere we created together. The first day you don’t know anybody and in 12 days you are like a family. 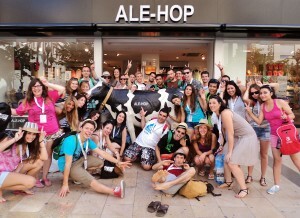 This is something what is very difficult to describe to somebody who is not in AEGEE. And I am really grateful that I had a chance to experience this. 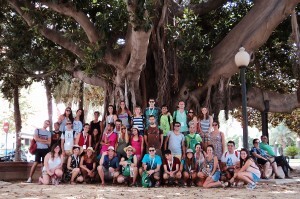 I am pretty sure that the people I met in Alicante this summer and the moments we shared together we will never forget. I would like to say MUCHAS GRACIAS to our “Hey Guuuuuuuuuys SU mum” Mar and her team that they made this happen. You guys rock! I would also like to thank our “AEGEE peopoooool man” Brauli for spreading the good energy. I loved it maaaaaan! Your positive attitude was really addictive! And I would also like to thank all the participants because you really made this summer #thesummerofmylife! Stay awesome! Let the AEGEE spirit stay forever in your hearts. ← Azerbaijan: land of fire and much more.